Shiny Object Saturday: Zojirushi! Zojirushi! Given that I’ve had such a busy work and play week, I’m stunned to find that I didn’t jot off a little something for a regular post. Goodness, here it is S.O.S. already. Mmmmm. Love this stuff. Probably because it has tasty autolyzed yeast as well as “natural flavors” (a code word for MSG, perhaps?) It saved many a dinner during the writing of my first novel–when I kept getting distracted by the words and momentarily forgot that I had three other people depending on me for mealtime sustenance. Plain, hearty brown rice is what I serve now, usually cooked in no-added-sodium chicken broth. But it does take watching, particularly on our substantial but quirky gas stove. 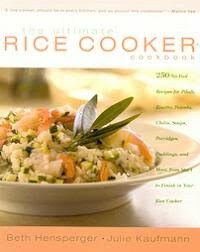 So I’ve been hoping for and hinting about a fancy rice cooker for a long, long time. Say hello to Zojirushi! Zojirushi! I can’t say its name just once. In fact, I tend to sing out its name as I go through the kitchen. It’s a cheerful little machine. I think of it as a tubby white critter that perches on my kitchen counter just to be helpful. It’s definitely the Hello, Kitty of rice cookers. It beeps. It plays a melody. It’s cute as a bug. It makes wicked rice. I’m a mix between an aural and a visual learner. Instruction manuals are anathema to me. I have to read them six times, then act them out, step by step, or I tend to miss critical elements. Because Zojirushi! Zojirushi! is a Japanese product produced for a Japanese market, I struggled with the directions’ idiosyncrasies. 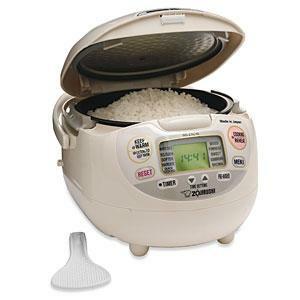 Like: Was I using washed or unwashed rice? There are two different measuring cups–neither of which measures out as a cup. Which embossed measurements inside the steaming bowl are for which? Zojirushi! Zojirushi! also makes porridge. What is porridge, exactly? I know I should look it up. P says it’s millet. Hm. I’m much more excited about sushi rice possibilities. And Indian rice. 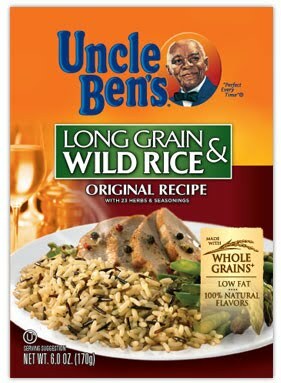 And wild rice. P also gave me a cookbook for my birthday to go along with Zojirushi! Zojirushi! It tells me I can make pea soup in a rice cooker, too. Not that I ever would. Still, it’s riveting reading. Can’t wait to try it out. Also, it tells me the recipes can handle rice cookers with neuro-fuzzy logic. Best that I can tell, neuro-fuzzy means that they combine logic with a kind of techno-intuition. Maybe. All I know is that I don’t have to stir anything and that I can wander off and write or garden and my little neuro-fuzzy friend does the work and doesn’t burn the rice or set the house on fire. Love that. That really is cute! Of course, I have not cooked in many years but I still love all the little gadgets so very much.